Nidal Hasan-42 was sentenced to death by a military court Wednesday for his 2009 massacre at Fort Hood. 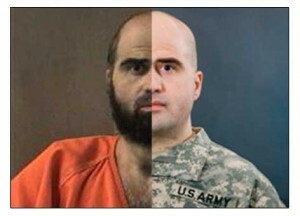 The American born terrorist who was also a Major in the United States Army went on a shooting spree at the Fort Hood Army Base on November 5, 2009, killing 13 people and wounding over 30 others. He claims he did it to protect the Taliban from American aggression. He has never disputed the accusations of being the gunman. In fact, he told a jury in opening statements that he was the one who opened fire in a crowded waiting room filled with soldiers as they were getting their final medical checkups before leaving on deployments to both Iraq and Afghanistan. The same jury that convicted Hasan last week of 13 counts of premeditated murder and 32 counts of attempted premeditated murder, is the same jury that sentenced Hasan to die on Wednesday. It has been over a half of century since the last time a U.S. soldier was executed. However due to the American military justice systems lengthy appeals process, it could very easily be decades before he is put to death. The president must give the final order of execution of a service member. “He is a criminal. He is a cold-blooded murderer. This is not his gift to God. This is his debt to society. This is the cost of his murderous rampage,” said Col. Mike Mulligan, as he pleaded with the jury to sentence Hasan to death. Mulligan also recalled to the jury how Hasan was a trained military doctor, a Major of the U.S. Army who opened fire on a room full of unarmed, defenseless comrades. During the trial the judge did not allow for Hasan to tell the jury that the mass murder was necessary to keep American troops from harming Islamic and Taliban leaders. Troops were waiting in long lines to be cleared by doctors or receive immunizations when the terrorist began firing his weapon. Along with the 13 fatalities was a pregnant private who had reportedly plead with Hasan to spare the life of her baby just before he shot her while she curled on the floor. Survivors of the attack say that it was nearly impossible to stop the shooting due to training he sought in reloading with speed and precision by an instructor at a gun range outside of Austin, Texas. The instructor stated that he told Hasan to practice while watching TV or with the lights off. Investigators found 146 shell casings inside the building along with dozens outside as a result of Hasan shooting troops in the back as they ran toward the parking lot. Rapid reloading enabled him to get off nearly 200 rounds in 10 minutes before being shot in the back by a civilian police officer responding to the call. Hasan is now paralyzed from the waist down. Justice may have been served, but the lives of so many people will forever be affected by the cowardly acts of this terrorist.